Cyprian of Carthage, also known as Saint Cyprian (died September 14, 258) was a bishop of Carthage, martyr, and an important early Christian writer involved in several notable controversies. He was probably born in North Africa and he received an excellent classical education before converting to Christianity. He soon became a bishop but faced controversy for fleeing the city in the face of persecution and then taking a strict position on the readmission to the Church of those Christians who pledged absolute loyalty to the Emperor or who had offered pagan sacrifice under duress. During the Novatianist controversy, however, Cyprian's view played a moderating view between those who wanted no sanctions on those who had lapsed during persecution and those who insisted that they not be readmitted to the Church. In a later controversy with Pope Stephen I, Cyprian came out the loser when he insisted that baptism by duly ordained priests who held heretical views was invalid. Cyprian eventually died a martyr at Carthage. He left a number of significant writings, especially De unitate ecclesiae, in which he insists that there is no salvation outside of the orthodox Christian Church. Cyprian was of a wealthy and distinguished pagan background, from Carthage, the most important Roman city on the African continent and the site of a thriving, if contentious Christian culture. The site of his eventual martyrdom would be his own villa. He was either of Punic stock or, as is sometimes claimed, a Berber. After receiving a classical education, he became a teacher of rhetoric and possibly a lawyer. The date of his conversion is unknown, but after his baptism, about 245-248, he gave away a portion of his wealth to the poor of Carthage, as befitted a man of his rank. His original name was Thascius; he took the additional name Caecilius in memory of the elderly presbyter to whom he owed his conversion. In the early days of his conversion he wrote an Epistola ad Donatum de gratia Dei ("Letter to Donatus concerning God's grace"), and three books of Testimoniorum adversus Judæos that adhere closely to the models of the earlier Carthaginian Church Father Tertullian, who influenced his style and thinking. The latter is an important document in the history of Christian anti-semitism, affirming that the Jews have been abandoned by God because of their rejection of Jesus. Not long after his baptism Cyprian was ordained a deacon, and soon afterward a presbyter. Some time between July 248 and April 249 he was chosen bishop of Carthage, a popular choice among the poor who remembered his patronage, while a portion of the presbytery opposed it, for all of Cyprian's wealth, learning, diplomacy and literary talents. 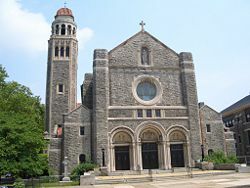 Moreover, the opposition within the church community at Carthage did not dissolve during his tenure. Christians in North Africa had not suffered persecution for many years. Soon, however, the entire community was put to a severe test. Early in 250 the Emperor Decius issued the edict for the suppression of Christianity, and the "Decian persecution" began. Measures were first taken demanding that the bishops and officers of the church sacrifice to the Emperor, an oath of allegiance that was taken by Christians as profoundly offensive. The proconsul on circuit and five commissioners for each town administered the edict; but when the proconsul reached Carthage, Cyprian had fled. The Christian community was divided on this occasion between those who stood firm in civil disobedience at any price, and those who favored submitting either in word or in deed to the order of sacrifice and receiving a receipt called a libellus ("booklet"). Cyprian's secret departure from Carthage was interpreted by his enemies as cowardice and infidelity, and they hastened to accuse him at Rome. The Roman clergy wrote to Cyprian in disapproving terms, but he answered that he fled in accordance with visions and the divine command. From his place of refuge he ruled his flock with earnestness and zeal, using a faithful deacon as his intermediary. The persecution was especially severe at Carthage. Many Christians fell away, and were thereafter referred to as "lapsed" (lapsi). Many afterward asked to be received again into the Church. Their requests were at first granted with little regard for the demand of Cyprian, who insisted upon earnest repentance. Cyprian now censured all laxity toward the lapsed, refused absolution to them except in case of mortal sickness, and sought to postpone the question of their readmission to the Church to more quiet times. A schism broke out in Carthage with the deacon Felicissimus opposed to Cyprian's strict policy. Cyprian deposed and excommunicated him, but Felicissimus was upheld by several presbyters, and a determined opposition was thus organized. Meanwhile, after a 14-months absence, Cyprian returned to his diocese. He defended leaving his post and the tract De lapsis ("On those who fall away") and in letters to the other North African bishops. He called a council of North African bishops at Carthage to consider the treatment of the lapsed and to deal with the apparent schism of Felicissimus. The majority of the council reportedly sided with Cyprian and condemned Felicissimus, though no acts of this council survive. Christians who had made or signed the written statements that they had obeyed the behest of the emperor were to be restored to communion upon sincere repentance; but those who had taken part in heathen sacrifices could be received back into the church only when on the point of death. The latter policy was soon liberalized, however. On the other hand, clerics who had offered sacrifice were to be deposed and could not be restored to their functions. The followers of Felicissimus then elected Fortunatus as their bishop in opposition to Cyprian. Meanwhile in Rome, the followers of the Roman presbyter Novatian refused all absolution to all the lapsed. They elected Novatian as bishop of Rome, in opposition to Cornelius. The Novatianist party also secured the election of a rival bishop of their own at Carthage, Maximus by name, resulting in a three-way schism in which Cyprian found himself in the middle. These extremes strengthened the firm but moderating influence exhibited by Cyprian, and the following of his opponents grew less and less. He rose still higher in the favor of the people when they witnessed his self-denying devotion during a time of a great plague and famine. He comforted his brethren by writing his De mortalitate, and in his De eleomosynis and exhorted them to active charity towards the poor, while he strove to set the best pattern by his own life. He defended Christianity and the Christians in the apologia Ad Demetrianum, directed against the charge of the heathens that Christians were the cause of the public calamities. But Cyprian had yet to fight another battle, which broke to the surface in 255, in which his opponent was none other than the Bishop of Rome, Pope Stephen I, who had succeeded the brief reign of Lucius I, Cornelius' successor. The matter in dispute was the efficacy of baptism when it was administered by heretical priests, and in this case Cyprian's view did not prevail. Stephen declared baptism by properly ordained priests who had fallen into heresy valid, if administered according to the proper formula, either in the name of Christ or of the holy Trinity, which was the mainstream view of the Church. Cyprian, on the other hand—believing that outside of orthodoxy there were no true sacraments—regarded baptism by heretics to be null and void. He therefore re-baptized, as if for the first time, those who, thinking they were Christians, had been baptized by clergy with heretical views. 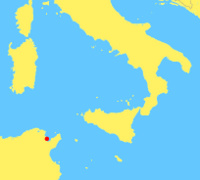 The majority of the North African bishops sided with Cyprian. In the Eastern Roman Empire he had a powerful ally in Firmilian, bishop of Caesarea. But the position of Stephen in Rome came to find general acceptance. Stephen also claimed of superiority of the Roman See over all bishoprics of the Church, one of the first major tests of Roman primacy. To this claim Cyprian answered that the authority of the Roman bishop, though higher in honor, was equal to—not superior to—his own. Stephen broke off communion with Cyprian and Carthage, though not going as far as a formal excommunication of Cyprian. 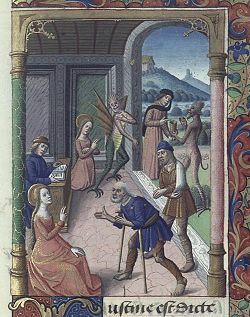 Cyprian, upper right, is tempted by demons, while Saint Justina, a later martyr, is pictured at the lower left. At the end of 256 a new persecution of the Christians under Valerian broke out, and both Stephen and his successor, Sixtus II, suffered martyrdom at Rome. In Africa, Cyprian courageously prepared his people for the expected edict of persecution by his De exhortatione martyrii, and himself set an example when he was brought before the Roman proconsul Aspasius Paternus in August 257. He refused to sacrifice to the pagan deities and firmly professed Christ. The consul banished him to the desolate Churubis, where he attempted to comfort his flock and his banished clergy to the best of his ability. In a vision, he saw his approaching fate. When a year had passed he was recalled and kept under house arrest on his own villa, in expectation of severer measures after a new and more stringent imperial edict arrived which demanded the execution of all Christian clerics who refused to offer obedience to the state by sacrificing to its gods. On September 13, 258, he was imprisoned at the behest of the new proconsul, Galerius Maximus. The day following, he was examined for the last time and sentenced to die by the sword. His only answer was "Thanks be to God!" The execution was carried out at once in an open place near the city. A vast multitude followed Cyprian on his last journey. He removed his garments without assistance, knelt down, and prayed. Two of his clergy blindfolded him. He ordered 25 gold pieces to be given to the executioner, who with a trembling hand administered the death-blow. The body was interred by Christian hands near the place of execution, and over it, as well as on the actual scene of his death, churches were afterward erected. These, however, were destroyed by the Vandals. Charlemagne is said to have had the bones transferred to France. Lyons, Arles, Venice, Compiegne, and Roenay in Flanders boast the possession of the martyr's relics. 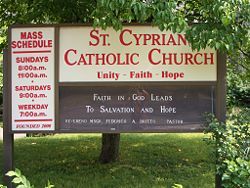 St. Cyprian is remembered most for his emphasis on the unity of the Church. Besides a number of epistles, which are partly collected with the answers of those to whom they were written, Cyprian wrote several treatises, some of which have also the character of pastoral letters. His most important work is his De unitate ecclesiae. In it, it states: "He can no longer have God for his Father who has not the Church for his mother... he who gathereth elsewhere than in the Church scatters the Church of Christ" (vi); and "nor is there any other home to believers but the one Church" (ix). Because of his martyrdom and exemplary personal life, posterity has had less difficulty in reaching a universally accepted view of Cyprian's personality than did his contemporaries. He combined loftiness of thought with an ever-present consciousness of the dignity of his office. His earnest life, his self-denial and fidelity, moderation and greatness of soul have been increasingly acknowledged and admired. He was the type of a prince of the Church. The glory of his courageous and edifying martyrdom can not be extinguished by the earlier charges of cowardice. He is most remembered as a martyr, and upholder of the unity of the Christian Church, and a moderating influence in the Novatianist controversy. His feast day in the Western and Eastern churches is celebrated on September 16, while his Anglican feast day is September 26. Hinchliff, Peter Bingham. 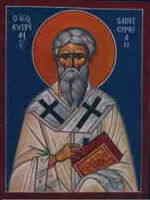 Cyprian of Carthage and the Unity of the Christian Church. London: G. Chapman, 1974. All links retrieved August 6, 2015. History of "Saint Cyprian of Carthage"
This page was last modified on 6 August 2015, at 20:39.